In the past few decades, globalization has narrowed the wealth gap between rich and poor countries, but fed into a growing crisis of inequality within Western countries. It has created a world where we drink coffee from Brazil, wearing a shirt stitched in Cambodia, checking a phone made in China, and think nothing of it. But is the steady opening up of global markets about to go into reverse? There was intense debate in Davos on the future of globalization – and the merits of a system that is under fire from populists of every stripe. “We may be at a point where globalization is ending and where provincialism and nationalism are taking hold,” said Ray Dalio , founder of the investment company Bridgewater Associates. He was responding to a question on the implications of US President Donald Trump’s economic policies. “You will see more protectionism, perhaps the reversal of the trend in the 90s of trade agreement and globalization,” he said. However, there were powerful calls for an open future. In his first appearance at Davos, China’s President Xi Jinping defended the benefits of economic globalization and its ability to lift people out of poverty. “It is true that economic globalization has created new problems. But this is no justification to write off economic globalization altogether. Rather we should adapt to and guide globalization, cushion its negative impact, and deliver its benefits to all countries and all nations,” he said. The importance of the business ties between the United States and China, the world’s two richest countries, was underlined when Jack Ma, the founder of China’s internet giant Alibaba , paid a visit to Trump Towers. Speaking at Davos, Ma said that America had benefited immensely from globalization – but that it had wasted its wealth. 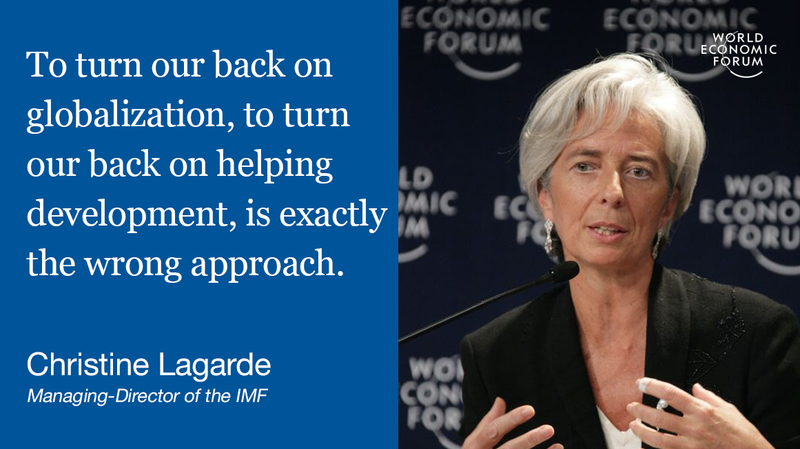 Christine Lagarde, Managing Director of the IMF , agreed that the gains of globalization needed to be shared more broadly for it to survive, reminding Davos that she had warned of the derailing effect of inequality in 2013. But the response should not be to turn backwards – or inwards, she argued. For Pier Carlo Padoan, Italy’s Finance Minister , it wasn’t a case of more globalization or less, but of a different and less predictable path, as some countries turned protectionist while others went in the other direction and deregulated their markets.